For the third time, we said goodbye to our sweet Diane—the caregiver for all of kids from about three months to three years (a bit longer in Owen’s case). This was by the hardest of the three transitions, in part because it’s our last. She’s helped our kids grow and mature, and she’s allowed us to focus on our careers, all the while knowing our babies are in exceptionally good hands. Day two was so much better, as evidenced below. The only downside was a cute little girl who cheerfully reminded me, “My mommy hugged you while you were crying yesterday!” thereby expanding the reach of my rather humiliating meltdown to an entirely new set of parents. Thanks, kid. But in all, the week’s gone very well. Owen even asked me to talk to him “about the earth,” and he’s made a new friend named Olivia. (“Not our Olivia, Mom. Another Olivia.” Noted.) 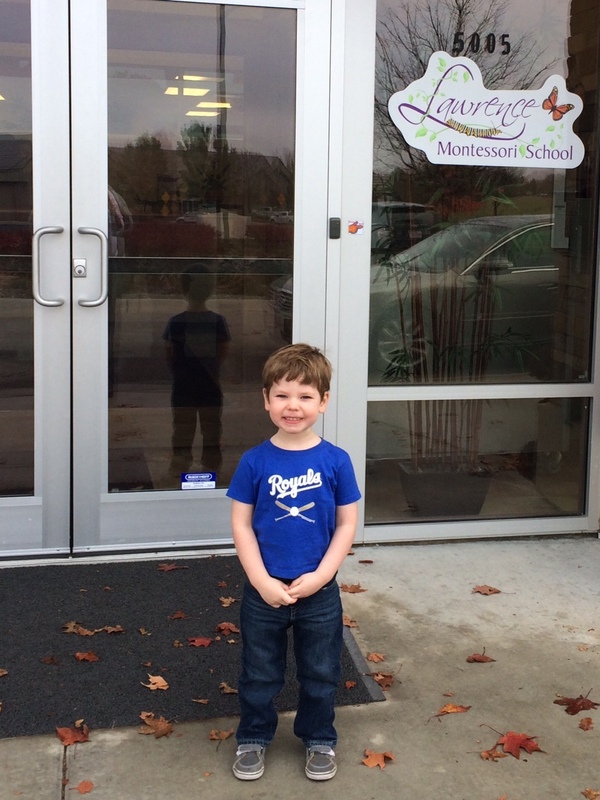 And, we can’t wait to see what he learns with Purviz. One more transition done, though with less grace than I’d have liked. Apologies for the complete radio silence this month. We’re getting back into the swing of things with school (somehow, today marks the third week since classes resumed!). Things are going well for the girls so far. Ava, admittedly, is far more interested in the social aspects of her education, and she has expressed displeasure with the rule that prevents previously successful incumbents from campaigning for student council. I’ve noticed (from afar) that her math homework is getting much more complicated (It could be algebra. Maybe. I’m not sure.). Her goal is to finish it as quickly as possible so that she can resume FaceTime with her friends. Olivia, as I’ve mentioned before, LOVES school and everything it brings. She’s required to read 40 minutes a week, but she’s decided to read 40 minutes a day. She makes us sweet gifts and cards, practices piano religiously and is only grumpy when she has to wake up earlier than she’d like. I’m liking this one a lot right now. And, Owen. Owen is three, and three is so much more challenging than two. Three is two, but with intent. But he’s so cute. And funny. (“I love you so much, buddy.” “I love you so much also.”) He literally asked to play in the dirt last week. Snuggles are getting fewer and farther between, but god help you if you pick up the new baby at daycare. This is a difficult phase. The days and nights are hectic and busy and probably not as nurturing they should be. However, I read an article (okay, just the headline), that said all I had to do was love them and keep them alive. One of my favorite blogs is known for occasionally submitting “WORDS” in place of actual commentary, as if real sentences can’t do justice to the ridiculousness of the situation. It’s likely an overreaction to do so here as I outline the past couple of weeks, but it’s tempting. If nothing else, it might explain my delay in writing. 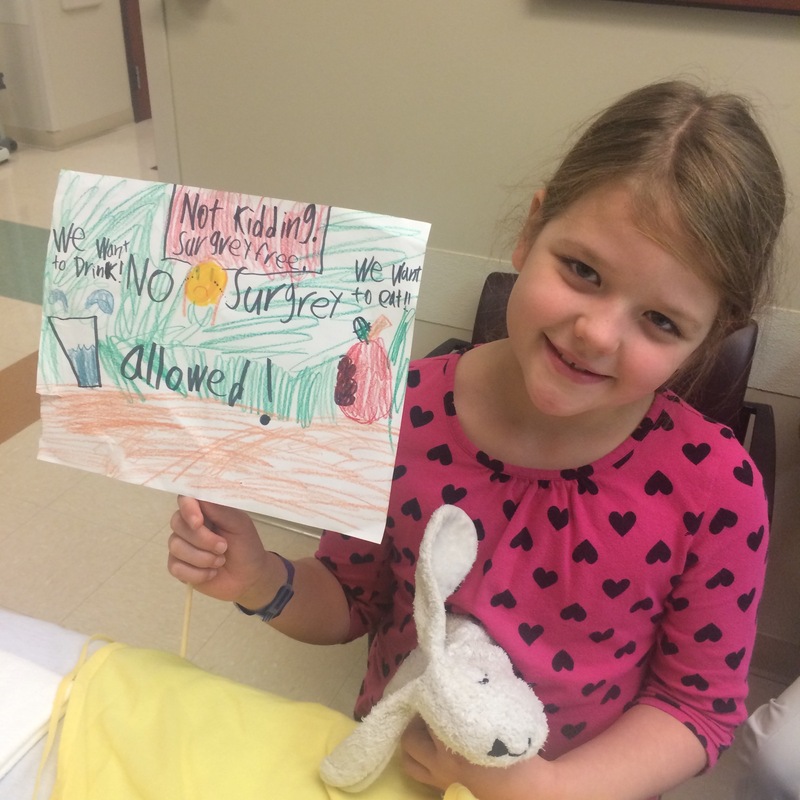 Ava had her tonsils out nearly two weeks ago. A couple of days prior to her scheduled surgery, our ENT recommended a third set of tubes for Olivia, who had straight up failed a hearing test at school. The scheduling nurse suggested we bring them into the surgery center on the same day. At first I was reluctant, but in the end, it was hard to argue with the efficiency a joint recuperation created. Both surgeries went well, and it wasn’t truly stressful until the girls were in recovery. (These were the fourth and fifth surgeries we’ve had as a family with this doctor, and so we knew we were in good hands.) But, it felt worrisome as Bryan and I bounced between post-op rooms, each of us catching only half of the instructions imperative for our patients. Olivia, who initially–and quite literally–protested surgery, woke with no discomfort and a smile on her face, thanks to a renewed ability to hear. Ava, on the other hand, struggled through strong pain medicine, and resisted the very things that would ease her transition from hospital to home. Ava continued to do the same (as she’s known to do) for days on end. She would occasionally yield, allowing us to give her pain medication and popsicles without protest. In my experience, there’s nothing more frustrating than seeing a child in tremendous pain decline obvious remedies. WORDS. But, the week progressed, and both girls were the beneficiary of incredible generosity: visits, calls, cards, gifts, homemade soup, balloons and even ice cream treats. These helped pass the time, and we were so appreciative of our parents, grandparents, siblings, friends and neighbors. Ava finally returned to school Monday, after 10 days of recovery. She’s nowhere near 100 percent, and I’m surprised she’s made it two full days. But, it seems she’s on the mend, and we are hopeful she will experience far fewer illnesses in the coming year. This fall has felt like a challenge for more than a handful of reasons, but if nothing else, we know we are fortunate to have tremendous support. Thank you!! Ten days ago, I completely lost my voice. I spent nearly 72 hours only able to whisper, at a time when my house was filled with family and Halloween hubbub. For someone who talks far more than I probably should, this sent me into a bit of a tailspin. It also forced me to recognize that much of what I say is unnecessary, and more importantly, the volume of my voice had little to do with how my message was received. Over the course of those three days, I lost what I had previous considered one of my most efficient parenting tools: yelling. Unlike my own mother, I’ve never been able to fully the master “the look” (which, by the way, still stops me in my tracks, and I’m nearly 36.) So, next to taking away screen time, I thought a loud voice was the fastest way to ensure compliance. Turns out, it’s not as effective as I’d imagined. I really felt like yelling. Instead, I calmly explained the source of ham, then tried to rationalize most everything else. I don’t know if it was effective, but I felt better about how I handled it. I was standing in the kitchen late last night, contemplating which of the pre-party tasks I could take on with so little time left in the day. I decided to work on number cookies, pulling the “8” from the tin of cookie cutters. It took me a split second to realize “9” was the only number I’ve yet to use in this set, and then “number” cookies will become hearts, or circles, or some other shape that indicates Ava is growing up far too quickly. The thing about making number cookies is that it’s a task that provides plenty of opportunity for contemplation and reflection. Nostalgia drives the process, after all. A few weeks ago, my mom noted that Ava wasn’t making as frequent appearances on the blog. And, it’s true—as she gets older, it’s harder to write about her in this way. She seems less a baby, less a kid, and more a person. A person who reads this blog herself, and a person who should probably have more to say about her online persona than her mother. And so, I hold back a bit more than I do with her siblings. I hope, though, once a year, she’ll forgive a few musings about who she’s becoming, and how her insistance on aging changes her mother, too. An old acquaintance of mine recently shared a story about taking her second-born in for five-year immunizations. She reported the child didn’t shed a single tear, though quickly added she couldn’t take much credit: Her firstborn had to be held down by four nurses during the same appointment a couple of years earlier. That addendum made me laugh out loud, because in our house, it was Ava who has made her siblings seem relatively easy by comparison. Perhaps there’s something to birth order, or perhaps it’s personality. Maybe it’s because these first children—daughters, especially—know they have the responsibility of training new parents. Ava’s certainly held our feet to the fire for the last few years. She questions our motives, executing a cutting cross-examination, and she will exploit any sign of weakness. She’s smart and shrewd and sharp-tongued. She started saying, “Because is not a reason” nearly as soon as she could talk. When she dissolves into a puddle on the floor, awash with tears, I remind her she’s eight now, and eight-year-olds most assuredly do not have tantrums. When she calms, she reminds me that eight really isn’t all that old. I worry incessantly about How She Will Turn Out. I want her to be self-possessed but gracious. Assertive but polite. Generous. Inclusive, responsible, poised. Driven. On any given day, I can give you numerous examples of how I failed in helping her become this person. Bryan believes if we just love her, she’ll be all of those things and more. He is nearly always right. To date, though, Ava at this age is my favorite challenge. She’s funny and helpful. She makes me work to be a better mom, and like her father, she forgives so effortlessly along the way. For that alone, I am truly grateful.